It drives every aspect of our lives. How do we stack up in the rankings? In work, do you get your self-worth from the number of sales you have brought in or the initiatives you’ve been able to bring to your business? Do you correlate the amount of your paycheck with your personal and professional value? Do you measure yourself by the house you own or the car you drive? Often times, we spend our lives comparing ourselves to others in a desperate attempt to derive more self-worth or somehow feel valued. I do think we should be proud of our accomplishments and set goals to pull out our best potential. The danger I find however, is when we derive our importance and self-worth from comparing ourselves to others and placing value on these goals outside the goal itself. Placing improper importance on the goal itself damages the life experience. What if you still strive to achieve excellence, but you knew your value was not based in how much or how little you have or are able to do? What if your DNF (did not finish) in the last race didn’t matter to you anymore than taking first place in terms of how you see yourself? One of my favorite authors, Donald Miller, wrote a book called “Searching for God Knows What” where he profiles the broken human condition and points out that we are all trying to achieve success based on how we stack up against other people. In the book of Romans, the Apostle Paul clarifies that our inherent value has nothing to do with what we do or don’t do. (Romans 3:21-30) It has nothing to do with our accomplishments or feats in life. We are all valued as humans in the full and overflowing love that comes from God (whether you believe in Him or not). What if we all lived our lives knowing that we already had all the intrinsic value we need by just being us? What if we no longer compared ourselves against others because we were all at peace with who we are already? I had a business lunch with a gentleman this week that has done multiple endurance races. For this post, I’ll call him “Joe.” Joe calls himself an ‘adventurer’ and is always searching for that next thing to stretch his own level of comfort. He recently started a company to take business executives out on adventures and to teach them about living life to the fullest and reaching new goals that may seem impossible. “More”, I thought to myself. More. I personally know people that achieved amazing physical feats of endurance. I know people that have completed dozens of Ironman races and ultra-races. What is interesting is that even a lot of these people are wondering what is next. There is a hole they are also trying to fill, and it’s never enough. Stop for a second and think. What if there is truly a deep longing and desire in us that we are trying to fill? What if we are all trying to fill that desire with MORE? More work, more money, more athletic accomplishments, more charity work, more being better parents, spouses or whatever it is you pour yourself into? What if that desire and longing was divinely placed in you to connect to God, the creator of the universe? A God who will give you purpose and acceptance no matter what job title you have or how many medals are on the wall? A God who hard wired you for relationship and a perspective that the things of this world don’t matter as much as we think they do? In the mist of all the things I personally strive for at work and athletically, I am already complete. I love a good challenge, but I don’t need more. I personally don’t have a deep need or longing to find out what’s next in order to feel peace. Sure, I had to die to placing huge importance on the things most of the world values the most, but the freedom I have is unexplainable. God has stamped my heart with grace. I think Joe is right in saying “Deep down inside of each of these guys, there is a hole they are trying to fill.” Where he has it wrong is in thinking more accomplishments will fill the gap. What fills the gap is feeding the spirit. When I look at the sunrise, I have joy in my heart and amazement that I know the creator of this beauty. When I finish a race, I praise God for crafting such an amazing matrix of nerves, blood, muscle and skin that is capable of amazing things. When I look at the world and politics, I have a peace in knowing that no matter what happens in the world while I am here, I am still in God’s hands and I will live eternally in His presence. When I look at my bank account, no matter the balance, I know it is enough. I have a joy that surpasses circumstance and a peace that is indescribable. I don’t have all the answers, but one thing I believe is true– the only path to true fulfillment is relationship with Christ. With that, you will never need anything more. I’ve had three months to reflect since my last Ironman. This one was particularly special to me. Training was super difficult due to my full-time job, Micah at home and the need to fit eating and sleeping in the mix. We moved to Colorado, so I really did not have anyone to train with. When I wanted to go for a ride or run with a new acquaintance the conversation would stop short when I mentioned the distance of the workout. Finding running partners for 16-18 mile Sunday runs was impossible, so I spent long hours each week training alone. When you are alone for 15-20 hours a week, you have a lot of time to think. While I love the terrain in Colorado and being close to family, I miss my friends in San Diego tremendously. I spend time flipping back and forth between thoughts about how much I love my new home, and how much I miss my old one. In some ways, the chaos of training for my Ironman took my mind off the emotion that comes with trying to rebuild your life somewhere new. After the race, I went into a small depressive state. In some ways, I am still there. After you cross a finish line that big and experience the release of hearing your name called on the PA system, it is easy to get lost. There is no point to your workouts any more. You step on the scale to a bigger number each morning. You have an extra beer at night to escape but the reality of finding purpose is hard to come to terms with. I have spent time asking what is next. Is another big event the answer? Is this all there is to life? Go to a job during the day, watch my son play around for a couple of hours at night put him to bed and then fall asleep watching The Voice just to repeat it all the next day? I felt so alive when I was training and now I feel so numb. I understand what it means to fight depression. It runs in my family and unless you have battled it personally, it is tough to comprehend. Even talking to family about it is tough. “Why would you ever be depressed? You have a wonderful job, an even more amazing family, and a son that fills your heart with so much joy you want to explode.” And yet some days I don’t feel like getting out of bed. I have just recently come to terms with the fact that I have fought this disease most of my life. I can remember times in High School when I did not feel like getting out of bed and facing the day. Even thinking back further in my past, I have struggled to stay happy and connected to every moment. Two things have been tremendous in fighting the battle. My faith gives me confidence that there is a greater purpose here. I look at each day as an opportunity to serve, and love others. I try to die to myself and let God lead. The second thing that helps me is sport. While I’m not the best athlete in the world, cycling and running provide me an outlet to fight my demons head on. The longer and more challenging the workout, the better. Make it hurt. I have never felt so alive as I do after a workout so long and hard all I can do is lay on the floor in exhaustion. The drug of crossing the finish line at Ironman is one that will keep me coming back for more. However, sometimes I wonder if this is really an outlet, or if I am simply running away from my fears and reality. I’m writing about my battle for the first time in hopes that this will be my first step in overcoming the disease. If I am ever left without sport as an option, I need to face the reality of life and quit running from it. I need to look at my beautiful family, thank God for the air He gives me to breathe and know that is enough. As we rebuild our lives here in Colorado, I know there will be the usual ups and downs. We will meet new friends, build new memories, run new races, and see the sun rise many times. This is life. I think sometime in history a group of men got together and created a plan to celebrate their élite status in society. They figured out a way to keep the plan secret to outsiders but still appoint a date on the calendar where everyone knew about their plan. Their plan was to create a day called “Father’s Day” where all the men with children would be treated like royalty and have free reign of the planet. As a new father welcomed to the secret order this year, cards started arriving in the mail early in the week. On Sunday I woke up to gifts, text messages, and phone calls, as the other daddies welcomed me to the club. It was like waking up one morning to another birthday. “What would you like to do today honey?” my wife asks me. “Where would you like to go to dinner and celebrate?” Brilliant! With the blessing of being a father and the showering of awesomeness comes the next best reason for me to celebrate Father’s Day. The annual Newbreak Community Church Father’s Day Cake Contest. 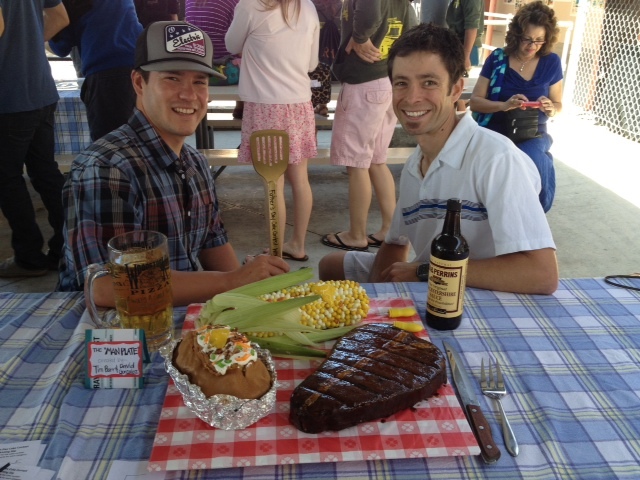 This annual cook-off between the men of our church, brings out the serious battle axes as there is no greater honor than taking home the Golden Spatula for Best-in-Show. I inherited some good creative cake skills from my mother, and I work in the design/construction industry so the combination is lethal. Every year the bar gets raised as we try to think of bigger and better things to create. Watching the winners each year, there is a combination of both shock value and craftsmanship that wins the day. Trying to come up with ideas to tie these together can take the next 11 months to figure out. While I was teamed up with another guy from our church putting together this year’s cake, I started really wondering why God wired me the way he did. I am almost overly competitive when it comes to things. I was the top male student in my high school class in academics. I want to be successful at work and win every project that hits the streets. I want to win the bike races I enter, and if I don’t feel fast enough, I don’t even want to show up and race. I race people on the freeway, just to find out we’re heading to different locations. I went over and over in my mind about the healthiness of being this competitive. God showed me how, although I am competitive, I get just as much joy out of helping others be successful. I can usually see a path to success in most situations, and this gift is one that I can use for my own benefit as well as others. I need to be careful not to let pride get in the way of being humble enough to help other people. As I work through my own competitive issues, I will do it yet again with the Golden Spatula hanging up in my kitchen. I can crack a smile and know that God also has a Golden Spatula hanging in his house for creating each one of us in His own image. Our Father.